With the initiation of the Stabilisation and Association Process (SAP) in 1999, the EU Commission expressed its commitment to contribute to the progress and stability in the Western Balkans. This was further underscored by the announcements at the Santa Maria da Feira European Council in 2000 that all countries in the region are potential member states. With respect to Albania, Bosnia and Herzegovina, Croatia and the Former Yugoslav Republic of Macedonia, Serbia and Montenegro, the SAP has already yielded significant success with the negotiation of Stabilisation and Association Agreements (SAA). But there is one country in the region with which there is still no SAA and it is a key to restoring peace and security on the Balkans - Kosovo. On 10 October 2012 (revised on 23 October 2012), the Commission presented a feasibility study on to the last of the Western Balkan countries to establish a closer relationship with the EU, paving the way for the substantive negotiation of a Stabilisation and Association Agreement between Kosovo and the EU. Unlike the other countries of the Western Balkans, Kosovo confronts the EU with a unique problem as regards to its status in international law. Only 22 out of the 27 EU member states recognise the independence of the former Serbian province leaving Spain, Slovakia, Cyprus, Romania, and Greece objecting such a recognition. The Feasibility Study, accompanying the Commission progress report on Kosovo of 10 October 2012, sets out the political and economic aspects that will influence Kosovo’s obligations under a SAA and subsequently assesses its ability to assume these obligations. In the light of the initiated Pristina Dialogue, the Commission is of the view that "the benefits of a [SAA] would serve as an encouragement for the population of all of Kosovo". Its purpose is to assess whether Kosovo has undergone an economic and political development that enables it to commit to the "extensive obligations of an association agreement." In its Communication, the Commission highlights that Article 318 of the Treaty on the Functioning of the EU (TFEU) does not in fact require the recognition of Kosovo by all member states. Just as the EU has signed agreements with entities other than sovereign states, an SAA could be negotiated and concluded with Kosovo irrespective of the member state's individual position on Kosovo's status in international law. This being said, the Communication highlights clearly that such an agreement "does not constitute recognition of Kosovo by the Union as an independent state nor does it constitute recognition by individual Member States". The Commission concludes that there is "no legal obstacle for the Union to conclude on that basis an association agreement with Kosovo". The assessment was generally welcomed in the European Parliament, although the motion for a resolution expressly encourages the five remaining member states to revise their decision on the recognition of Kosovo. In order to ensure fulfilment of its obligations under a SAA Kosovo must demonstrate "credible engagement to undertake democratic reforms and free and regular elections". Although the study points out the considerable progress made over the past years to establish a political system that is generally based on the foundations of democratic principles, it also highlights the "serious shortcomings and technical difficulties" of the last general elections in 2010/2011 and demands "legislation [which] better reflects best practise in the EU and implementation […] in line with international standards". This requires strengthened coordination between the parliament of Kosovo and the government allowing more fiscal oversight and political control over the executive; a more decentralised, efficient and accessible administration system including the establishment and empowerment of all relevant institutions and the modernisation of civil service regulations; increased scrutiny or security policies by the parliament. The revised judicial system, put in place as of 1 January 2013, reflects "the principles of [judicial] independence, impartiality, accountability and efficiency". Nonetheless, under a SAA Kosovo would commit to further strengthen impartiality, eradicate corrupt behaviour, guarantee professional capacity and a smooth transition toward the new judicial system, reduce the backlog of cases and improve the institutional framework of the Kosovo Judicial Council and the Kosovo Prosecutorial Council. Impunity and access to justice need to be efficiently guaranteed. The fight against corruption is of particular importance. The study highlights the progress made by putting in place an institutional system to investigate and prosecute economic and financial crime. It highlights, however, that efficiency needs to increase and proportionate rather than symbolic legal penalties need to be implemented. In its resolution the European Parliament emphasises its concern with the lack of significant progress in the fight against corruption and organised crime. Regarding the protection of human rights, Kosovo has established a framework that, while protecting civil, political, economic and social rights, is too complex to be effectively monitored. Implementation needs to speed up. Of particular concern is the still unsatisfactory protection of freedom of expression, there are reports of torture, ill-treatment and gender inequality. Kosovo provides a very elaborate system of protection of minorities and cultural rights. Under a SAA, a continuous "focus on promoting multi-ethnic Kosovo" is a prerequisite. In the economic area, the focus should predominantly be on liberalisation of prices, trade and current account transactions as well as strengthening the private sector by progressive de-monopolisation. Due to its detachment from the international economy and despite its evident orientation to the euro, Kosovo has not been hit severely by the global crisis and thus managed to maintain a stable environment of economic growth. This said, unemployment is extraordinarily high and the underdeveloped production sector reveals the need for urgent structural reforms. "Most of the labour force is unskilled or semi-skilled, implying potential constraints for businesses trying to develop in sectors with higher value added. High remittances inflows […] tend to increase the reservation wage and reduce incentives to work. The lack of perspective for a job, especially among the young population, is putting strains on social cohesion and encourages emigration". As the Commission report points out, another structural challenge is related to the growing current account deficit, despite its preferential trade regime with the EU, Kosovo’s most important trading partner, particularly for industrial goods. According to the report, the vast majority of export products are primary goods and with low added value. The Kosovo economy is highly reliant on the service sector which, despite being the only sector showing positive trade balance, is incapable of offsetting other trading imbalances. Foreign investments predominantly flow into non-tradable sectors which further embellishes the existing structure. Although corrective actions appear to be fruitful in decreasing the budget deficit in the course of the last year, the study emphasises on the heavy infrastructural investments, such as the highway to Albania, which has severe budgetary consequences and leaves little to nothing for other expenditure "that could contribute to improving social cohesion and prospects for sustainable long-term employment and growth". Private sector growth is, according to the study, mostly suppressed by corrupt business practises, unfair competition or simply the lack of access to finance. One of the benefits a SAA would hold for Kosovo and the EU is laying the foundations for a political dialogue that allows streamlining the mutual interests and discussing regional and international issues. The Communication highlights that the north of Kosovo continues to represent an important challenge for Kosovo-Serbian relationship and to Kosovo's development in the enlargement process. Nonetheless, the commitment to political dialogue by both sides has vividly been illustrated at the dialogue meeting on 19 February. Then, Herman Van Rompuy, the European Council president, met Kosovo’s Prime Minister Hashim Thaci to discuss "an ambitious agenda in 2013 which offers good prospects for Kosovo", after the words of Mr Rompuy. At the press conference after the meeting, he went on stressing the importance of Kosovo meeting short term goals such as full cooperation with the EULEX (the European Union Rule of Law Mission, which is another necessary commitment underscored in the report). He furthermore praised the commitment and progress demonstrated by Kosovo with regards to the issue of visa liberalisation. An additional point that is emphasised both in the Feasibility Study and by Herman Van Rompuy concerns the Kosovo-Serbia relations where the EU acts as a facilitator. Efforts initiated in early 2012 have already resulted in substantial agreements on various issues, including, amongst others, free movement of persons, customs stamps and recognition of university diplomas. Kosovo has since been working on the implementation of these agreements and remains committed to establish a constructive relationship with Belgrade. 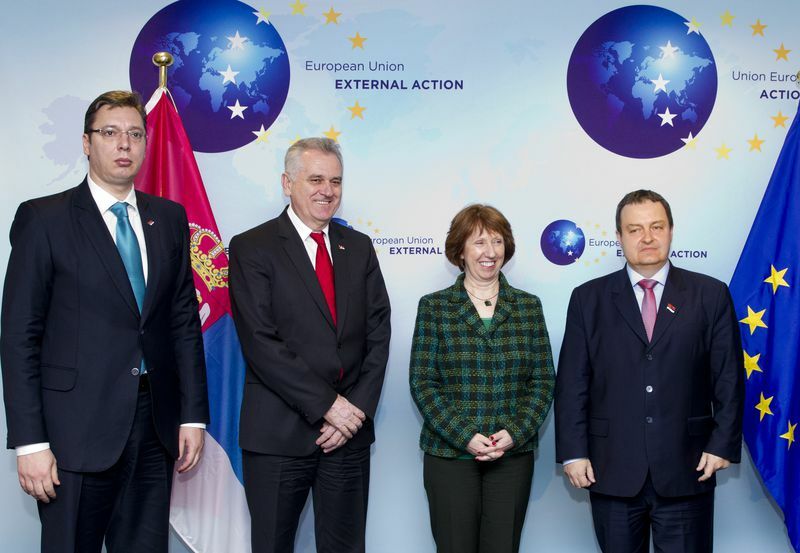 The historic meeting in Brussels on 6 February between the Serbian and Kosovo presidents, Tomislav Nikolic and Atifete Jahjaga, underscored the commitment of Kosovo and the progress made in this respect. It was the first official encounter between the two heads of state since Kosovo’s declaration of independence in 2008. 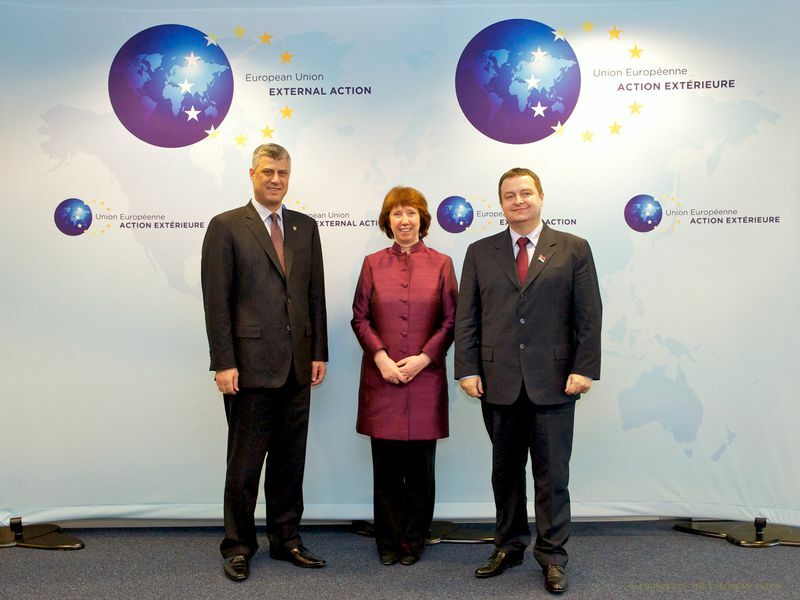 According to the EU High Representative Ms Ashton, "both President Nikolic and President Jahjaga have assured […] their continued support and commitment to the dialogue and their respective European agendas". 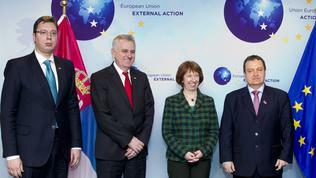 The prime ministers of both countries, Hashim Thaci and Ivica Dacic, have also met on several occasions recently. The Feasibility Study confirms that Kosovo is generally ready for negotiations on a SAA. The critical analysis of shortcomings is overall counterbalanced by the benefits Kosovo would obtain under such an agreement. As such, the alignment of its legislative framework in all areas is likely to significantly ensure benefits from a closer relationship with the EU. Other policy goals such as in the area of asylum, migration and visa will become more achievable under a SAA. Existing discrepancies are clearly visible and the immigration into the EU via Kosovo remains a huge challenge, yet the steps taken in the recent past to coordinate border and immigration issues with Serbia, the former Yugoslav Republic of Macedonia and Montenegro reflect undeniable progress. The ongoing conflict in the north of Kosovo constitutes "not an obstacle to negotiate the agreement". 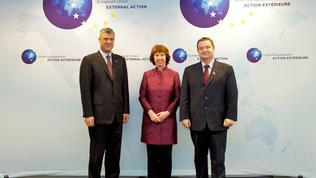 Overall, the development of Kosovo under the SAP is work in progress, reflecting generally positive results. The negotiations on an SAA with the last remaining Western Balkan country without contractual relationship with the EU are foreseeable in the future. For Kosovo, the benefits across all sectors are clear. But so are the obligations and responsibilities that such a commitment brings. Be that as it is, recent developments such as the meeting of the Kosovo and Serbian presidents in Brussels earlier this year, reflect the genuine level of ambition and lay the basis of a significant evolution in the EU-Kosovo relationship. But "the pace of progress depends on Kosovo", the report concludes. Slavs are eternal enemies of Europe..
Who is responsible for WW1? The Serbs thats who..
Why did we have WW2. Because Hitler fought in WW1 and Germany was forced to pay for WW1..